PIGEON FORGE, Tenn. (June 2012) – Dollywood launched America’s first wing-design roller coaster, Wild Eagle, in March and now has announced another coaster addition. This one adds water. It is RiverRush, Tennessee’s first water coaster, which will open in May 2013 at Dollywood’s Splash Country. “You know me. I love making a big splash, and RiverRush is all that and a whole lot more!” Parton said, dressed as super hero “Splash Woman” at the coaster’s announcement. 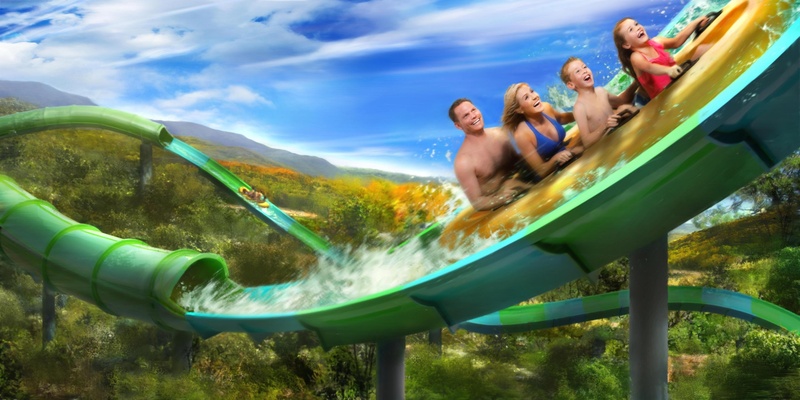 RiverRush will be a hydromagnetic coaster with climbs, drops, twists and tight turns – just like a traditional land roller coaster – but you’ll need a swimming suit to ride it. Four-passenger toboggan-style boats will zoom through a 1,175-foot-long track after making an initial climb of 237 feet. The first drop is at a 45-degree angle. It will be four stories tall and have a footprint of more than an acre.